Second Life Research Journal | How are people finding information in Second Life? How are people finding information in Second Life? 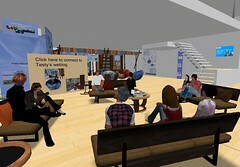 My Second Life research project concluded with an end-of-term presentation within Second Life. My advisor, Michael Stephens, and two other avatars showed up to hear my research results and participate in discussion. You can see my final presentation slides here. This blog will continue to exist as a record of this project but I’ll no longer be actively posting to it. So, signing off, thanks much to those of you who have followed this project. I appreciate your kind comments and words of encouragement along the way. The end of a MLIS degree, the start of a new career! This past Monday, I presented the results of my research project to Michael Stephens, my faculty advisor, and three other guests who joined us in Second Life. Stay tuned for a slideshare presentation to include the content of this presentation. Pictured above is my avatar practicing for the presentation before any attendees had showed up. Completing this presentation marked the end of my MLIS coursework. I now have 2 weeks of R&R before beginning my new job at Thomson Reuters. Horray! Sheila Yoshikawa (Sheila Webber in real life) hosted me at the InfoLit iSchool in Second Life for a rousing discussion around my research findings. Quite a crowd of avatars showed up, and the discussion was lively. One strand of the discussion dealt with whether libraries and librarians in SL should extend services to ‘generic’ SL users or stay focused within targeted communities — often based on real life social groups like a student body at a university. Here is some of the conversation. Stay tuned for a link to the full chat transcript. [12:49] You: I’d like to return to the question of whether or not it’s worthwhile to even try to extend services to “all” SL users, or are libraries better served to set up shop with a defined RL group of users in mind (e.g. a student body)? [12:50] Frances Obolensky: Why call it a library? Why not an infomration kiosk? [12:50] FORTUNATA Questi: I think in setting up ANY environment, you have to imagine a group of users with a group of needs. [12:50] Robin Mochi: I’m actually thinking that roving reference in SL may make more sense in many ways. [12:50] You: Riven, your RL town? Or a region of SL? [12:50] Solobill Laville: I think that specificity is really key actually. [12:50] You: Robin, how so? [12:50] Sheila Yoshikawa: so – different views! Does a 3D immersive environment suggest new models of information seeking behavior? Just how are people getting at information in virtual worlds? What does this mean for libraries and librarians? At this event, I will share my research findings about at how people in Second Life seek information. This presentation will use voice and will be recorded. The landmark will place you in a general welcome area. From there, take the short path of large grey stones to the wooden boardwalk. Follow the boardwalk, and you will arrive at the presentation area located next to the China Cafe. A recording of this presentation will be archived on this blog. Margaret Ostrander (Testy Outlander) has spent the last two months conducting research about the information seeking habits of everyday Second Life (SL) users. Research findings showed that none of the users interviewed had used SL libraries, and nearly all were unaware of their existence. What should the role of the SL library or librarian be beyond the borders of places like Info Island? Why are so many SL users unaware of SL libraries? What is your institution doing to provide outreach into the vast corners of this rich virtual universe? How can the everyday information seeking behaviors of SL residents inform library services? Come join in this discussion! IM Testy Outlander for a landmark to this event.